Very compact and light bypass oil cleaners, specially designed to clean engine oil in a bypass loop; but also a perfect solution to clean diesel fuels. Effectively removes all the particles that are not removed by the conventional filters, and performs a total cleaning of the oil by removing solid particles (carbon, metallic particles) absorbing water and eliminating sludge and other oil oxidation residues. An absolute necessity when running on bio-fuel! Typically the bio-fuel will mix with the engine oil and create resinous substances that will harm the engine, even leading to engine breakdown, and considerably reduce oil life. Triple R will clean the oil, stabilise the oil condition, and consequently avoid and eliminate the creation of resinous substances. Also applicable for lube systems, gearboxes and machinery with a system pressure below 6 bar. For example: wind mills, transmissions, etc. The TR bypass filter connects directly to the engine main gallery, and the cleaned oil is returned to the engine oil pan. 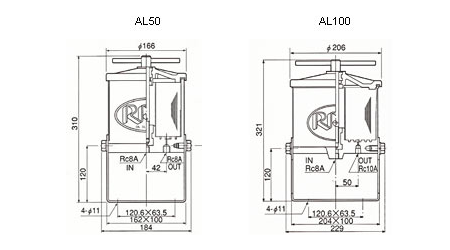 Additionally the AL100 housings are ideal to filter the contaminated diesel fuel, especially for engines using high pressure fuel injection pumps. Engine oil volume max 30 lit. Windmill gearboxes are a perfect application for a Triple R bypass oil cleaner. Triple R designed a special series for that purpose that allows longer oil life and reduces wear by removing solid particles, water, moisture and oxidation byproducts. The perfect "all-in-one" oil cleaning solution. Send your request to Triple R to get our windmill information package. Filter model E100 X100 D100 Main filter Max.